The Electrical Contractors Association of Quinte-St. Lawrence (ECAQSL) and their electrician partners in the International Brotherhood of Electrical Workers (IBEW) Local 115 have a long history of investing in their community. For almost 100 years, the ECAQSL and IBEW Local 115 have been building up their communities in more ways than one. Since 1926, Local 115 has been supplying the best trained electricians possible to wire new hospitals, schools, power generation facilities, and factories. But they and their contractor partners in ECAQSL also have a keenly-felt mission to give back to the communities in which they work and live. Five years ago, the ECAQSL-IBEW 115 partnership started a new tradition of donating 10 sets of season tickets per year to local hockey games to Big Brothers Big Sisters. This has helped a lot of kids enjoy Cornwall Colts, Brockville Braves and Kingston Frontenacs games, and get a much-needed break to enjoy themselves. “It’s a great feeling to give back,” says EQAQSL contractor Don Norman of Martin Electric. “We’re committed to quality, safety and reliability as well as giving back to the communities where we work and live,” he says. Part of the inspiration for the ticket donations came from working on the Rogers K-ROCK Centre. “The electrical contractors and electricians who worked on the facility are proud to have contributed to its construction,” says Norman. “There are a lot of power distribution and emergency systems behind the scenes to make sure concerts and shows can be delivered as seamlessly as possible,” he continues. The ECAQSL-IBEW 115 team has done electrical work for most of the major infrastructure buildings in the area. Examples include the Yardman Arena (home of the Belleville Senators), a Walmart warehouse in Cornwall, a BASF plant, and the Rogers K-Rock Centre, home of the Kingston Frontenacs. They are currently working on the Napanee Generating Station and a giant dairy that will create hundreds of local jobs. They also have a wealth of experience with health care facilities. They have successfully completed projects for the Kingston General Hospital, the Providence Care Hospital, and the Health and Wellness Centre at Queen’s University. 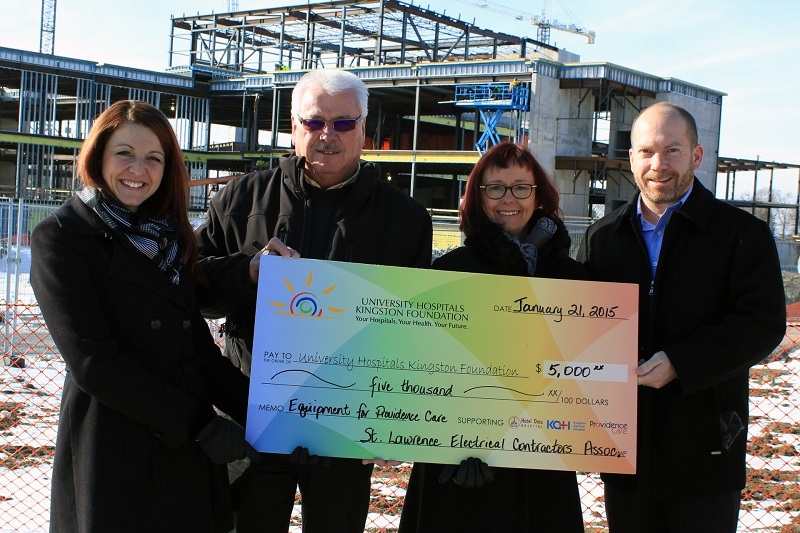 Both the EQAQSL and IBEW Local 115 make sizable donations every few years to the University Hospitals of Kingston Foundation. The Smiles Campaign provides a very direct way to help some of the youngest patients. The program gives kids with cancer brightly coloured pillow cases to cheer them through long hospital stays. “We hope the cheer these kids get from the bright colours gives them a morale boost,” says Pearse. Part of the secret to the success of the ECAQSL-IBEW partnership is the long-standing emphasis on higher standards for training, quality, and safety. It starts with choosing apprentices according to standards that are well above the provincial average. Every year during the apprentice intake, applicants compete for available places. Once accepted, no expense is spared on developing the talents of the apprentices. A dedicated training facility with one full-time and two part-time trainers ensures that apprentices get much more training than usual. “Thanks to our program, our apprentices are learning that they can do excellent quality work in the same time it takes other workers to do a second-rate or even unsafe job,” says Pearse. Perhaps most importantly for the future, the training program allows the entire team to adapt quickly as technology improves. Courses for journeypersons as well as apprentices ensure that as markets shift, the ECAQSL-IBEW team stays well ahead of the curve.